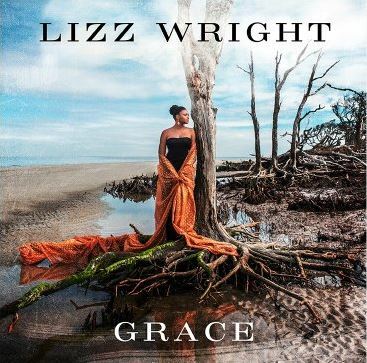 Lizz Wright is back with a new album called Grace. Continuing with her theme of presenting music that reflects her past and present state of consciousness, Wright has reworked well-known songs that have meaning to her. Grace is Wright’s second album for Concord Records in which she offers nine covers selected in conjunction with producer and songwriter Joe Henry and one original track co-written with Maia Sharp. The music is most frequently presented in a relaxed and intimate setting with emphasis on Wright’s soulful jazzy singing with a heavy does of gospel overtones. Grace begins with “Barley,” a track written and recorded by husband and wife duo Birds of Chicago for their 2016 album Real Midnight. Starting with drums and bass, Wright’s warm bluesy voice enters with authority. The song has a traditional spiritual structure that relies heavily on lyrical repetition, the lyrics convey the encouragement of inner strength and perseverance. With a relaxed feel provided by acoustic bass, guitar and brushed drums, the space is full, but filled mostly by Wright’s singing and that is what gives this track an intimate personal feel. Wright’s version of “Southern Nights” is especially enchanting. With a relaxed feel and Wright’s sensual vocal delivery that is always on pitch and flirts with the beat. The acoustic guitar and bass is augmented by organ and a soft drum beat. Wright’s sense of phrasing and her ability to convey energy in the way she delivers a melody, versus getting loud and boisterous or depending on the band to carry the energy is at the heart of the success of the album. Her voice is a strong instrument that nuances and connects the band and story of the lyric together. The last cut on the album is “All the Way Here,” which Wright co-wrote with Maia Sharp. With a soft pop- rock beat and strumming guitars, Wright’s melody starts in her lower range, but builds both melodically and instrumentally to a climax, a fitting end to the album. The lyrics are clearly personal. Wright also shows a different side of her singing style, a more pop-rock with a touch of country approach solidifies her abilities and eludes we still have many angles to explore with her singing in the future. Grace is a collection of relaxed tunes, presented in beautiful acoustic arrangements that lift the tremendous vocal abilities of Wright. The whole album puts the spotlight on melody and its delivery. Any music lover with find enjoyment in this collection, although it comes from a label known for jazz, this album is certainly a collection of music that has mass appeal to the general music world.